The requirements for earth resistance levels are becoming more stringent these days because of the lower operating voltages and higher operating speeds in today’s electronics. For example, telecommunications companies typically require an earth resistance of less than 5 ohms, which is less than half the resistance considered high-performance a few years ago. The engineers at E&S Earthing Solutions can help you plan and execute an electrical earthing design that will provide the best performance earth system available, within the constraints of your available area, budget, and equipment being protected. As the experts in electrical earthing solutions, we use specialized design software to model and build an electrical earthing system design based on the soil data, design goals, and other factors. After modeling the area, we will engineer an electrical earthing system design that will meet your performance objectives. Accurate soil resistivity data enables precise designs and predictable results. The type of soil, moisture, electrolytic content, and temperature also affect soil resistance. Frost line depth, water table level, bedrock, and available space dictate some specifics of the earthing system design. We determine soil resistivity using the Wenner 4 Point test method, or by analyzing soil samples. See our section on Soil Resistivity Testing for more information. When the soil resistivity of an area is so high that a low resistance earth isn’t feasible, bonding and other requirements, such as transient voltage surge suppression (TVSS) equipment can be implemented to achieve good performance. As part of our electrical earthing system design, the engineers at E&S Earthing Solutions provide a written recommendation along with a drawing of the site illustrating the recommended earthing configuration, quantity and location of the electrical earthing electrodes, earthing electrode spacing, and models. Electrical earthing safety systems are required to protect personnel working where earth rise potential hazards are known to exist. In fact, federal law mandates that all known hazards must be eliminated from the work place for the safety of workers. Substations are always considered workplaces and step and touch potentials must be eliminated to ensure the safety of work personnel. And, although transmission and distribution towers or poles are not always considered work places and are often exempt from these requirements, as soon as equipment is installed that is not related to the electric utility company and requires outside vendors to support the new equipment, it is now considered a workplace. Cellular telecommunications, environmental monitoring, and microwave relay equipment are good examples of equipment that, when installed on a high-voltage tower, turns the tower into a work place. Federal law 29 CFR 1910.269 specifically states that step and touch potentials must be eliminated on transmission and distribution lines that include any related communication equipment. This would make the elimination of step and touch potentials required. See our section on step and touch potential for more information. Lightning is a random and unpredictable event. 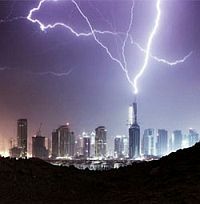 Globally, some 2000 ongoing thunderstorms cause about 100 lightning strikes to the earth each second. Did you know that total equipment damage costs from lightning strikes is approximately 150 million dollars every year in the United States? The average lightning strike will cost approximately $30,000 in equipment damage. However, if the building and equipment is properly earthed personnel injury and equipment damage can be reduced or eliminated entirely. In fact, a Lightning Strike Analysis is a critical component in comprehensive cell site earthing design. The option to install a lightning protection system is a critical decision for the purposes of safety of personnel, protection of property, insurance costs, and downtime. The engineers at E&S Earthing Solutions provide lightning stike analysis based on the requirements set out in the 2000 edition of NFPA 780 Risk Analysis Guidelines (National Fire Protection Association Standard for the Installation of Lightning Protection Systems).